The Town Hall is now closed until completion of the Our Town Hall project in 2024. The Town Hall Extension will be open as usual. There are bus stops in Albert Square and on Princess Street. 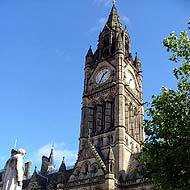 For more details about buses to the Town Hall complex please check the Transport for Greater Manchester website or call Traveline on 0871 200 2233 (7am to 8pm, Monday to Friday, and 8am to 8pm at weekends and bank holidays). If you are travelling to Manchester by train you can get a Metrolink tram from Piccadilly, Victoria and Deansgate train stations to St Peter's Square, which is the nearest Metrolink station to the Town Hall complex. If you are using a Sat. Nav. system, use M2 5DB. You may be able to find a pay and display parking bay. There are a number of car parks in Manchester city centre operated by NCP. Contact them on 0845 050 70 80 or visit their website to find out where they are and current charges. The Town Hall extension has two entrances, one on Lloyd street and one in St Peter's Square. Both are at street level with no steps. There's a reception point at each entrance. The Customer Service Centre is on the ground floor of the Town Hall Extension. All visitors have to report to one of the reception points. You will be asked to give details of the person you are visiting or meeting you are attending. If you have received a letter from us inviting you to an interview or meeting it is important that you bring it with you.